Various measures are in place to address the issue of home ownership by the lower income group, the Urban Well being, Housing and Local Government Minister Datuk Abdul Rahman Dahlan shared. 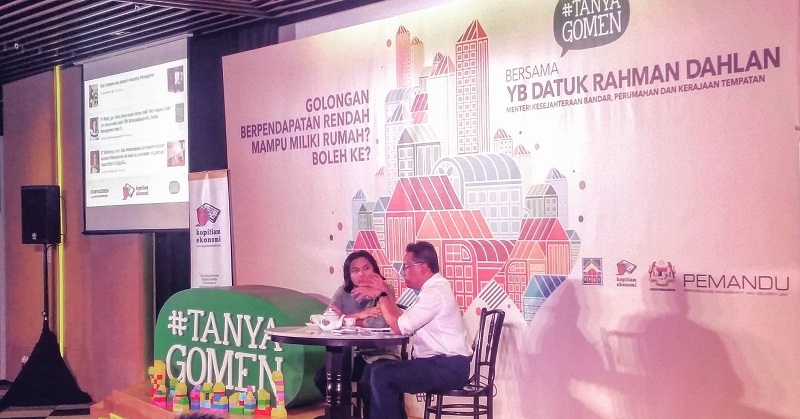 At the recent #TanyaGomen forum on whether the lower income can afford a home, Rahman Dahlan discussed some of the issues that help and hinder home ownership and how the Government is taking proactive measures to address that. The annual rate of appreciation for homes has dropped from 12.2% in the fourth quarter of 2012 to 5.9% in the second quarter of 2015, he said. This signified a reduction by almost half in home price annual appreciation. However, he added that too much of deflation in housing prices will affect the economy negatively. He also urged that irresponsible property investors who cause housing prices to increase should stay away from the housing market. On the issue of “build-then-sell”, Rahman Dahlan said the Government has decided to defer the implementation of the policy on developers as another measure to keep property prices under control. This was because smaller developers would not be able to complete construction first before collecting any payment from buyers. This will result in a smaller supply of homes in the market, consequently leading to inflated prices. Not all developers have the capacity, especially financially to build the homes first. Therefore, it is common for them to get progressive payment through housing deposits to cover construction costs. The Government wants to ensure that there are sufficient houses in the market so that prices can be kept under control. Therefore, it is better to delay the enforcement, in order to slow down the rate of increment in prices. A study on the status of residents living at People’s Housing Projects (PPR) will be conducted in 2016, said Rahman Dahlan. He said the move was taken following complaints that some PPR homeowners were renting out their houses to third parties to earn extra money. This study will help identify which homeowners are abusing their PPR flat ownership by renting it out to a third party or have already sold the houses before the moratorium expired. The study was expected to take between six months to a year, and an evaluation and follow-up actions would be implemented by the National Public Housing Management Corporation (3PAN). This will improve monitoring and prevent misuse of low cost PPR flats in the country. Even if the case occurs in small-scale of 5%, it is not fair to the other lower income families who are waiting to be housed. The ministry would study a proposal to create a Rent-to-Own (RTO) scheme, as an alternative for those who want to buy a house under the National Housing Department, said Rahman Dahlan at the #TanyaGomen forum last week. The scheme will ensure that developers continue to build houses according to the needs of those interested to own a house. Currently, the scheme is being implemented by the 1Malaysia Public Housing Project, which is a RTO programme for 10 years for applicants who are successful in the draw for PR1MA houses but fail to get loan approval from the PR1MA panel bank. Under the RTO scheme, applicants are required to rent the PR1MA houses for up to 10 years and would be given the option to buy the property at the end of the 5th or 10th year at a price set by PR1MA. Speaking on abandoned housing projects, Rahman Dahlan said the number of abandoned projects were considerably small. There are only 226 abandoned projects involving 60,895 housing units out of the 3,772 projects since 2009 (as at October 30, 2015) in Peninsular Malaysia. Out of that, 173 abandoned projects involving 47,100 units were revived and completed. Meanwhile, 20 abandoned projects are in the revival process, and the remaining 33 projects are in planning stage. To address house buyers’ issues, the Government have tightened (amended) laws (including Housing Development (Control and Licensing) to protect the people from errant developers.